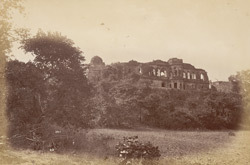 Photograph of the Baz Bahadur's Palace at Mandu, taken by Deen Dayal in the 1870s. Mandu was the capital city of the sultanate of Malwa between 1401 and 1561. Situated on the spur of a plateau amidst the Vindhya range of central India, the fortified mediaeval citadel overlooked the Narmada valley. Mandu went through many changes of rulers before lapsing into silent ruins. The Malwa sultanate of the Ghauris and the Khiljis was taken by a Gujarat sultan, then it fell to the Mughal emperor Humayun in 1534. The struggle between Humayun and Sher Shah Suri resulted in Mandu passing into the hands of Sultan Baz Bahadur from 1555-66, when he was defeated by Emperor Akbar. Baz Bahadur's legendary romance with his Hindu queen Rupmati adds to the mystique and melancholy of Mandu. He fled the Mughals and she committed suicide. Built in 1509, this palace was later taken up by Baz Bahadur. The complex is built in a mixture of local and Mughal styles and consists of a large open court with many rooms opening onto it. Beyond the colonnade on the north side there is an octagonal pavilion with arches.